Buy Sperry, Saucony, Skechers, Pony, and other shoes with up to 70% Discount at Markdown Madness in Glorietta 2: Details Here! Markdown Madness, one of the biggest sale events in town, is happening once again in time for an early Christmas shopping! 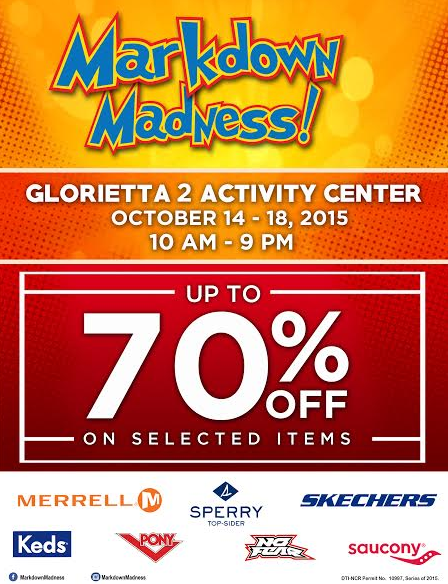 Enjoy up to 70% discount from October 14 to 18, 10 a.m. to 9 p.m. at the Glorietta 2 Activity Center in Makati. Participating brands include: Skechers, Merrell, Sperry, Keds, Saucony, Pony, and No Fear. Markdown Madness promises to be another grand sale event so don’t miss this chance to get the best shoe deals in town! For more information and updates, visit Markdown Madness on Facebook and follow their Instagram account @MarkdownMadness.